Welcome to DLS, the digital logic simulator game. 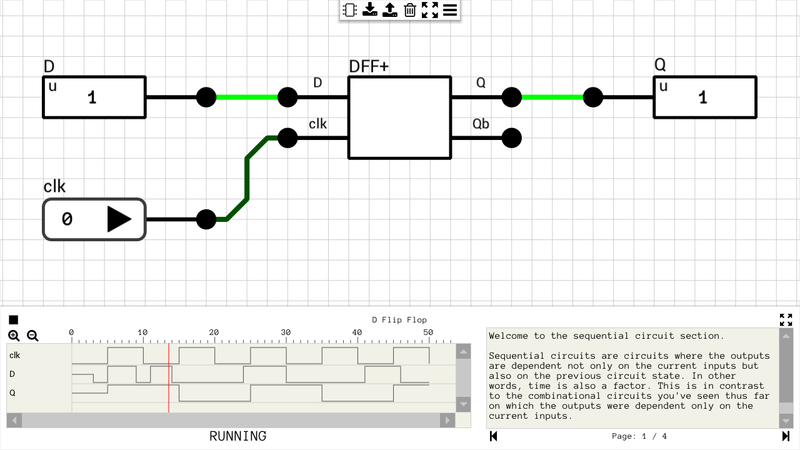 Truth table levels where your goal is to build a circuit to match a given truth table, under certain restrictions (e.g. limited types of gates). 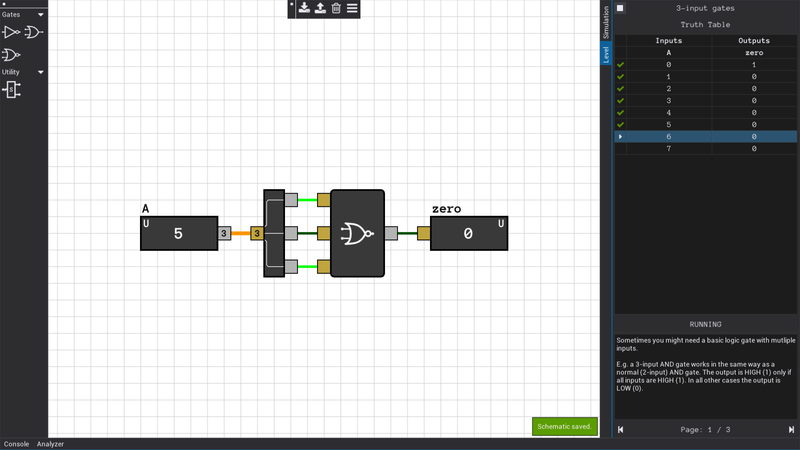 Sequential levels where your goal is to create a circuit to match a given timing graph. Stream levels where you have to build a circuit to process several inputs streams and produce the desired outputs. 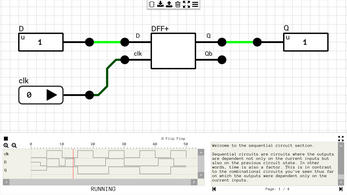 A powerful sandbox editor where you can build whatever circuit comes to mind! 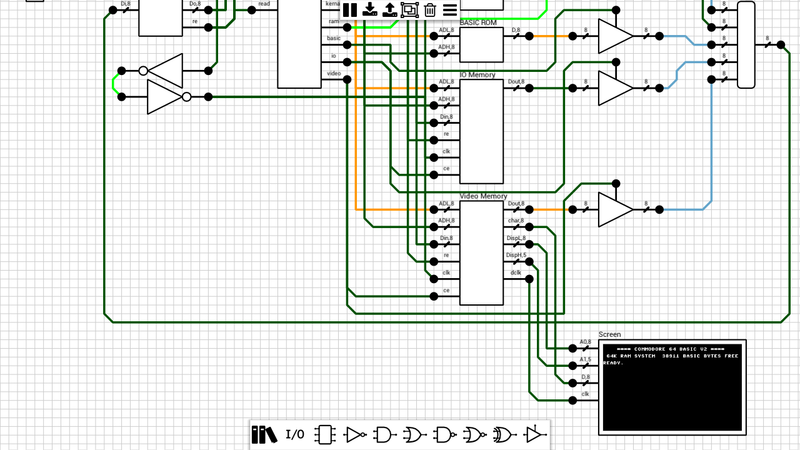 Includes a logic analyzer to debug your circuits, calculate propagation delays and/or find hazards and glitches. 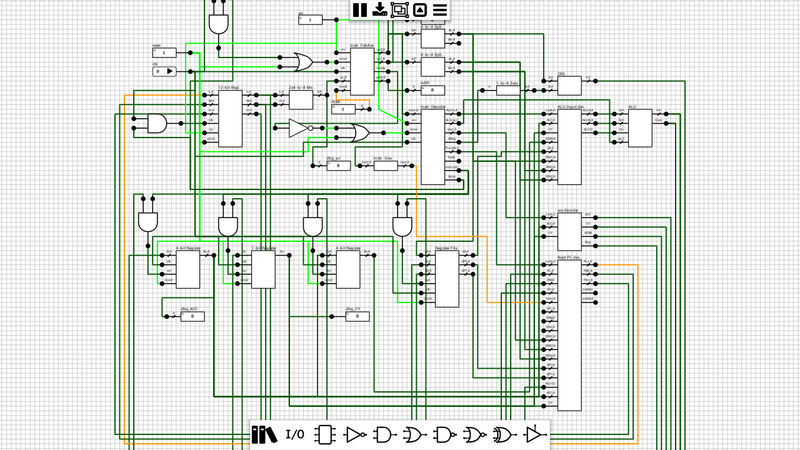 Create and organize components into packages and use them to create larger and better circuits. DISCLAIMER: This is an alpha version of the game. 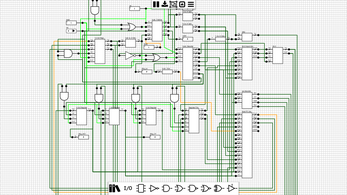 Although the simulator is capable of handling relatively complex circuits, you might find that certain configurations don't give the expected results. If this is the case, you can send us the schematic in question to find out what's going on and how we can fix the simulator. 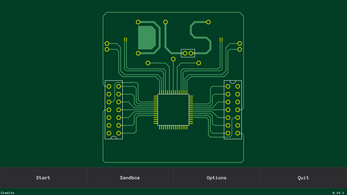 DLS is a time-driven event-based multi-delay 3-value digital logic simulator. Time-driven means that the circuit time is advanced forward based on a user-specified target speed, which is measured in circuit nanoseconds per real second (ns/s). 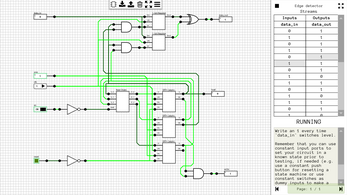 The simulation will always advance to a new state if there are pending signals in the circuit's queue. This means that even unstable or asynchronous circuits can be correctly simulated. 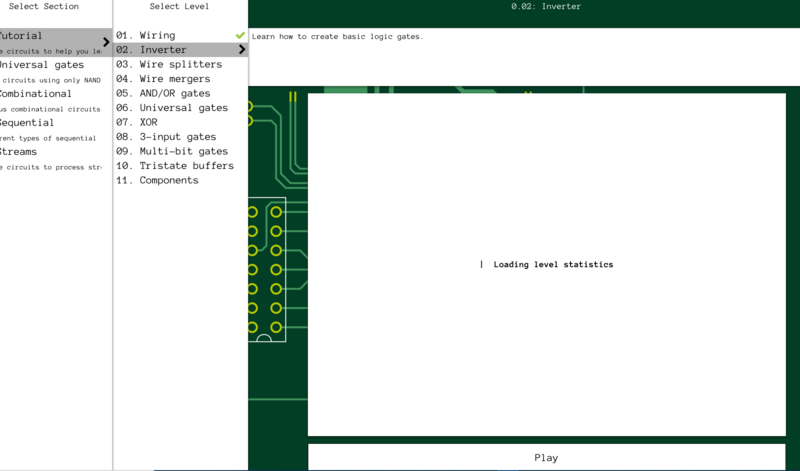 Event-based means that a gate is simulated only if one of its inputs changes value. 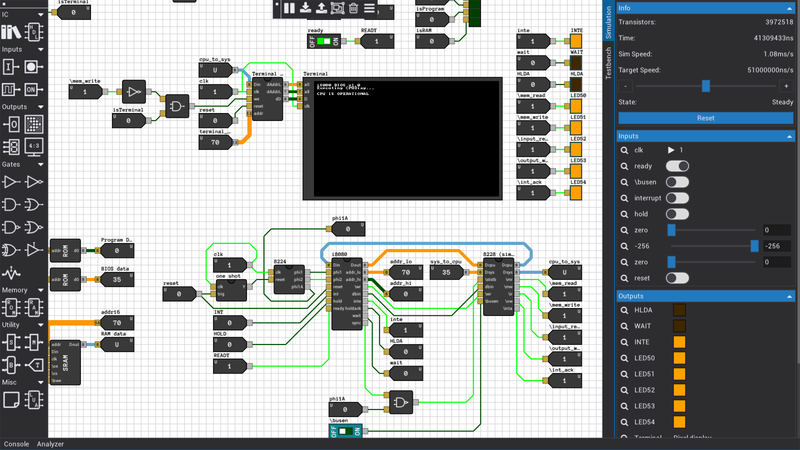 Otherwise the previous output is considered valid and used as input to all connected gates/components. Multi-delay means that each build-in gate/component type has its own propagation delay which is always an integer greater than or equal to 1. 3-value means that in addition to logic levels 0 and 1 there's an extra logic value (U for Undefined) which is used as both Z (high impedance) and X (undefined) signals, depending on its origin. We would like to thank their developers for building them and making them public/free. 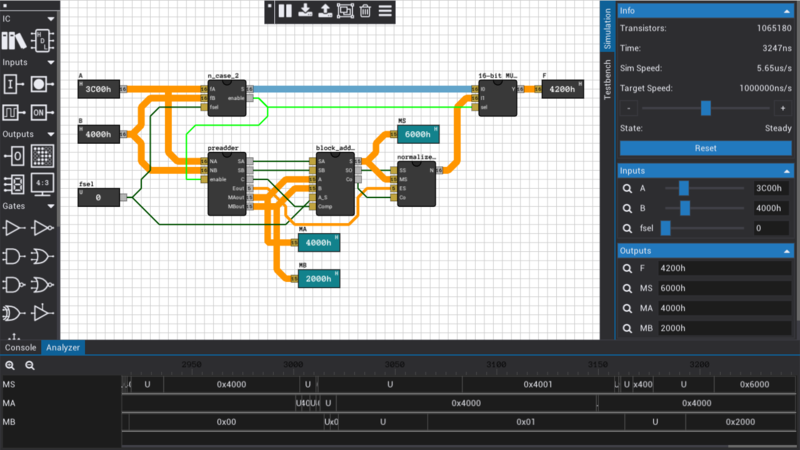 NEW: HDL: Added muxn() and bit_length() functions. FIX: Crash on macos with Metal renderer when creating pixel displays. 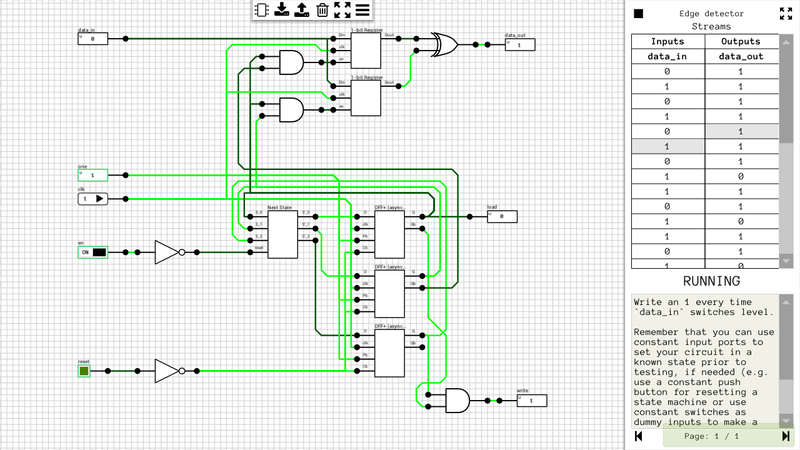 FIX: Changed propagation delays of HDL-only simulation components. FIX: Crash when calling tick() in testbenches without a clock name. FIX: HDL: Register's default value after creation is now itself. FIX: Clock frequency in clock configuration dialogs is now displayed properly. 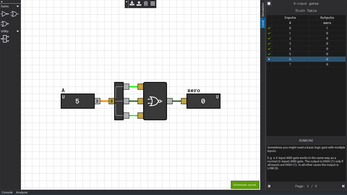 FIX: Logic Analyzer: Center the value of multi-bit signals inside their box even if the box is larger than the screen. 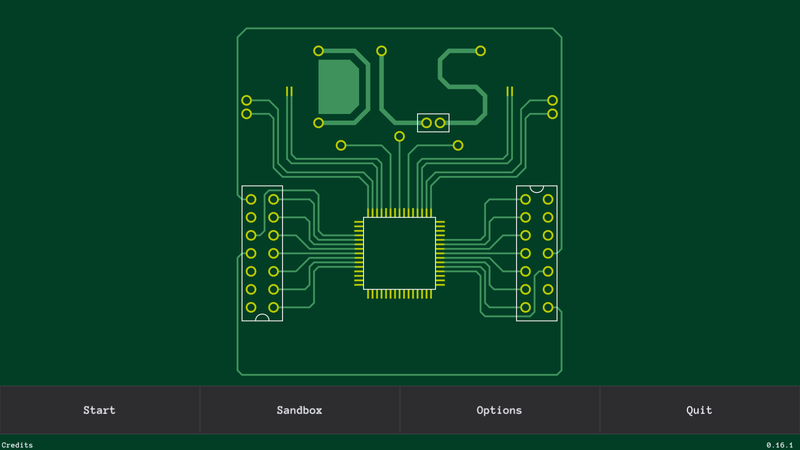 For details on previous versions, see Releases.txt or the sandbox manual.